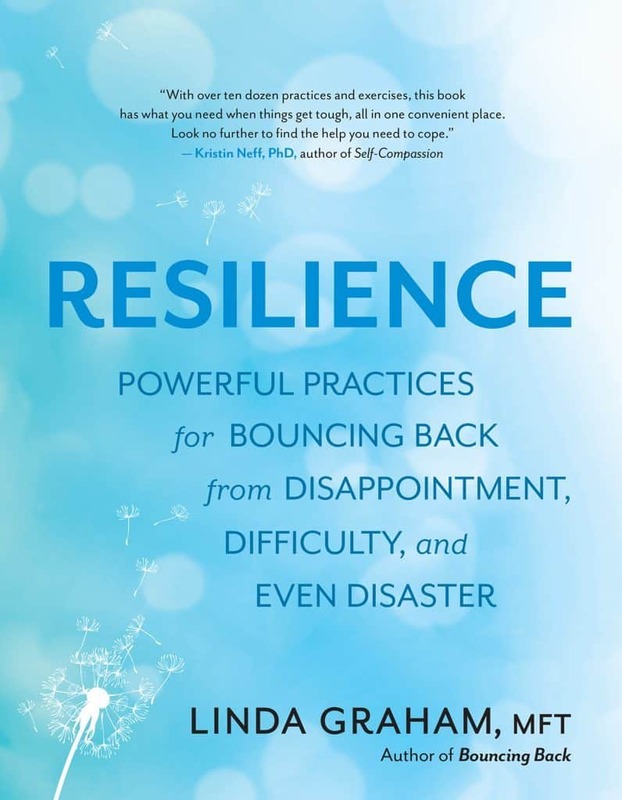 The new Resilience: Powerful Practices for Bouncing Back from Disappointment, Difficulty, and Even Disaster is on its way. More than 100 evidenced based practices to strengthen your innate capacities to cope with anything, anything at all. Forthcoming September 15, 2018 from New World Library. You can learn more about the new book here. You can pre-order the book from Amazon here if you wish. Resilience is based on 25 years’ experience guiding psychotherapy clients to meet the challenges and catastrophes of their lives with greater skill and resilience. For at least 20 of those years, I have also been focused on integrating cutting-edge research discoveries in Western behavioral sciences and modern neuroscience, attachment theory, interpersonal neurobiology, positive psychology, resilience training, trauma therapy, and post-traumatic growth. For those same 20 years I have studied and taught practices from Eastern contemplative traditions, focusing on mindfulness and self-compassion practices, recognized as two of the most powerful agents of brain change known to science. Since the publication of Bouncing Back: Rewiring Your Brain for Maximum Resilience and Well-Being in 2013, I have been refining the practices now included in Resilience in national (and international) trainings in the neuroscience of resilience, caring for the brain – caring for the self, facing the mess we’re in with compassion, clarity and courage, and shift happens: learning to cope with disappointment, difficulty, and disaster. This month’s posts will focus on body-based practices of breath, touch, movement and visualization to help you find that inner safety zone more easily. You breathe all the time. To breathe is to be alive. Every inhale activates the sympathetic branch of your nervous system just a little bit (a lot when you overreact to something and you hyper-ventilate). Every exhale activates the parasympathetic just a little bit (a lot when you are “scared to death” and you literally faint). You can learn to very intentionally use this rhythm of breathing in, breathing out (longer exhales) to cultivate more calm in the body and access a deeper well-being. 1. Breathe naturally, gently, for five to ten breaths. Mindfully pay attention to the sensations of breathing in (cool air through the nostrils or throat, the gentle expansion of the belly and chest) and breathing out (warmer air flowing out, the relaxation of the belly and chest). Remember the practical power of “little and often.” Pause and repeat this practice many times a day. 3. As you inhale, you can imagine “coming home” to yourself, resting in a pleasant sense of “I am here. I am home.” As you exhale, imagine connecting safely with the world outside of yourself, coming into ease and harmony with others. 4. Imagine breathing in to “me,” breathing out to “we.” Repeat this rhythm for a full minute. 1. Let your body sigh, a deep exhalation, releasing tension from your body. A deep sigh (or several sighs) is the body’s natural re-setter of the nervous system. You can practice pairing any moment of tension with a deliberate sigh. Even in the midst of a tense or frightening moment, a deliberate sigh can shift the physiology of the body into a more relieved and relaxed state. Each breath cycle gently exercises the rhythm of regulation of your “social” vagus nerve. Breathing in, activating the sympathetic, supports social engagement and connection; breathing out, activating the parasympathetic, evokes a sense of well-being. In this exercise, you synchronize your breathing with another person to strengthen the social engagement system as you add interconnection to the practice. 1. Have your partner lie down comfortably on the floor with eyes closed. Sit comfortably on the floor nearby. Come into a sense of presence, of being with this person, here and now. 2. Place one hand on your partner’s hand or forearm, the other hand on the crown of their head. Your partner breathes slowly, deeply. 3. Begin to synchronize your breathing with their breathing. Simply breathe together for two to three minutes, noticing the life force of the breath entering and leaving their body and yours. 4. After two to three minutes you and your partner can switch roles. All of the above practices, when repeated over time, help your brain find that inner safety zone, that natural physiological equilibrium, that is foundational to coming to calm, becoming resilient.